Click the person from the list you wish to view. You can also hover over the image of a person to view some basic information about them without needing to open their profile. Type the name of the person in the field on the left. 1 You can jump immediately to this field using the keyboard shortcut "/". 2 The person can be selected using the mouse or the arrow keys and enter button. Asterisk (*) = Searches for everyone who has any data in this field. Exclamation Mark (!) = Searches for everyone who has no data in this field. Asterisk(*) + Text = Treats the asterisk as a wildcard. For instance, you could search for all people with a last name starting with "Sm" by searching the last name field for "Sm*". Conversely, you could search for all people with a last name ending with "son" by searching the last name field for "*son". Surrounding Double Quotes = Searches text fields for that exact value (e.g. searching "ball" will only return ball, not basketball or softball). To sort your search results by zip code, you can export it to Excel and sort the results there. I would like to be able to select people on file based on if they have made any contributions or not. Can you help me with this? Hey Lynn - you can do this from the "contributions reports" area. Go to More > Contributions > Reports. Then select your date field and click on the little graph icon right below that and one of the charts you'll see is "givers vs non-givers grouped by family". If you click on either of those bars on the bar graph you'll have a list generated. Just note that the search is only looking at the date parameters that you gave. For instance, if you only looked at the dates July 1 and after, anyone who gave before that and has not given since will appear as a "non-giver". Hey Chris - The notes section cannot be sorted/filtered. Our recommendation is to use profile fields for notes instead of the one in the lefthand side if you want to be able to sort/filter messages. Alternatively you can export all the notes by going to More > Account Settings > Export > Notes. Then they will export into an excel document from which you can sort. • The letters A - D? • The letters B, G, and T? Great question! Currently at this time, you can only search last name field beginning with one letter at a time. You can also use Asterisk(*) + Text = Treats the asterisk as a wildcard. For instance, you could search for all people with a last name starting with "Sm" by searching the last name field for "Sm*". Conversely, you could search for all people with a last name ending with "son" by searching the last name field for "*son". I'd like to know if there is a way to search for everyone added in the last six months (for example) without putting in new dates each time I search. Is there some way to do that automatically? That way when I save the search and reuse it, I don't have to change the dates each time but, rather, it automatically looks for anyone added in the six months before that date. To search for added date, simply use the advanced search on the right of the People tab, scroll down to "Other" and then select the "Added Date". Then follow the steps in the custom saved search article to help you save your search. Can you tell me more about this keyboard shortcut, how to enter it and how to use it? 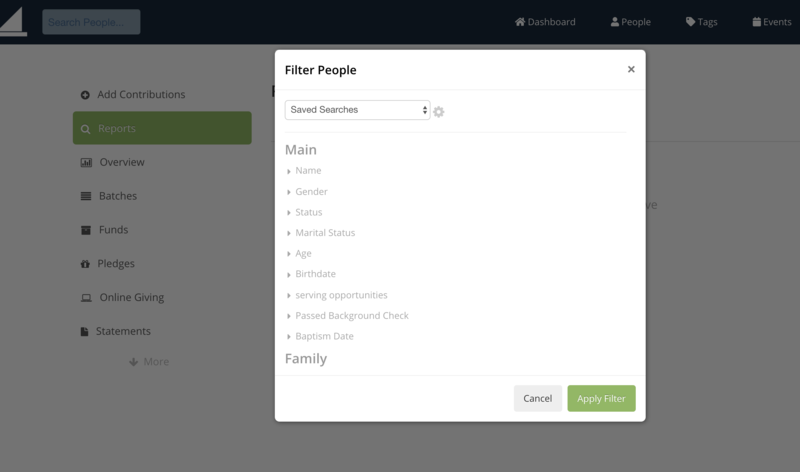 So that you can use the simple search to find a person, tag or event quickly. Select Dashboard < / and you will notice that it will automatically allow you to start typing a name in that field. Select the "Address" tab and enter the partial address. Is there a way to get a list of people who's birthday is blank? In the above comment, cornerstone asked how to search for people with blank birthdays. Emily W responded that an exclamation mark searches for everyone who has no data in this field. Sorry, but I don't see how to do this for a date field from the People ==> Show More Filter Options section. When searching a date field, you have 3 options - Range, Date and Relative. None of these options give you a place to type an exclamation mark. They are all drop-down fields that don't allow you to type free-form. I must be missing something. Could you please clarify? I am also looking for a way to find people that do not have a birthday in the system. My apologies! Please forgive me! :) You are most certainly correct. This is a GREAT observation! Happy to clarify! There is no quick search of this information through this particular filter. The best way to get what you're looking for is to Export the information to Excel and sort the Birthdate Column to show you which blanks are empty. From there, you could Copy all of the Email addresses and Paste them in a compose window for Direct Email outside of Breeze. (You wont be able to paste all of these addresses at once from Excel into Breeze Email. However, you could type them in one by one). Additionally, Exporting People will be most helpful! I apologize for the misinformation and know that this may not be ideal, but I do hope the information is most helpful! Here is what I ended up doing. Forgive I am still new at Breeze, but I will try to explain. I created a tag called Birthdays and then created a smart task to move people into that tag by filtering on "any" for the month, date and year and then having them automatically moved to "Birthdays". Once I did that I went to the people screen filter and under the "Tags" at the bottom I selected "does not contain" and then selected "birthdays" this left me with those who do not have a birthday. I hope that makes sense. Is there an easier way to search for multiple specific people? I would like to populate a list of specific people who requested their giving statements emailed to them. If you have them grouped by tags, then you can filter by that way. If this is marked in their profile you can also run a search for this as well. If you are searching for this particular group based off a tag or profile, you can search in the contribution section as well. Printing or emailing a giving statement based on a filter allows more control over what appears on the giving statement. Users can filter by fund, amount, or any other criteria, and only contributions that match the filter will be used when creating the statement. Get contribution reports for the contributions you'd like to include in the giving statement. Towards the upper right of the screen, find the "Download as Excel" button and click the arrow just to the right of it. Select "Print Statement" from the dropdown list and then click the "Print Statement" button. If you need any additional help, please reach out to our Support team via phone or by email. We are happy to serve!